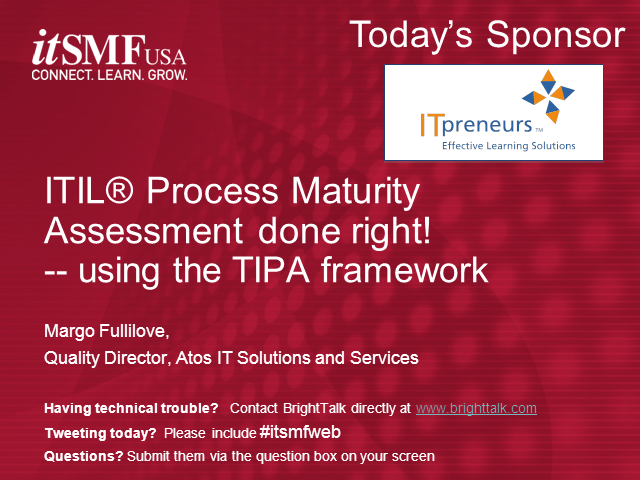 ITIL® Process Maturity Assessments done right! •What assessment models are available in the market? •What is ISO15504, and how is it used? •How ISO15504 ensures quality maturity assessments? •How TIPA for ITIL helps organizations improve their maturity? •What is included in TIPA? Configuration Management Databases play an important role in Service Transition and Operations. However, IT organizations tend to find a challenge in maintaining and supporting a Functional CMDB. In this webinar, we'll discuss tested effective methods to keep your CMDB Healthy. Configuration Management and its role (recap / reminder). What makes a CMDB functional? Success factors that contribute to the maintenance of a healthy CMDB. How can ITIL v4 help to empower Configuration Managers? Title: ITIL® Process Maturity Assessments done right!